I found a link to swimsuit designer Stephanie Hoos on Daily Candy. This design seemed eerily familiar. So the choice is yours. Buy this one for $160 or knit your own. Or run screaming from the room. My five year old took a spill on Sunday and hurt his hand. On Monday it had swelled up a lot and was very bruised. This morning it was still swollen and very hot to the touch. We got in to see the doctor this afternoon. Amazingly my son--never one to be compliant--was very well behaved during his exam and x-rays. They think he fractured one of the bones in his palm. He was given a splint made of some mysterious material that looks like cotton batting, only it heats up and turns hard as a rock, and an ace bandage. I thought he would tear it off immediately but he's discovered, within 15 minutes, that it makes a very loud sound when you tap it on stuff and that the sound drives mom crazy! Bonus. He also has begun talking to it like a hand puppet. His big brother was also very patient while we waited and waited and waited. He even entertained the patient by drawing Pokemon characters on a chalk board while the splint was applied. Neither Wes or I have ever had any broken bones. I'm amazed that it took 7 years of mothering boys to have our first fracture. 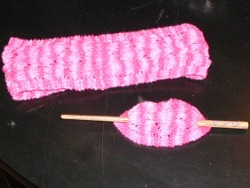 I was also able to make some progress on a cursed sock while waiting for all the various doctors and technicians. More on this later. How hard does she rock? Kay came up with this great meme using Google image searches. I hustled myself to Starbucks to meet my knitbuds and no one showed up. I sat and knit alone for almost two hours. I finished my contribution to Pinku's pink hair accessory exchange. It seems that everyone else is just buying stuff and sending it off. I don't get that. I can buy my own hair accessories. I knit some. I made the Lacy Hair Tamers from the Subscriber Only section at Interweave Knits. They're designed by Veronik Avery (I'd link to her site but it's not up right now). They were quick and fun to knit. Here is a horrific photo of them. I used Cascade Fixation. The striping isn't quite as awful in real life but it does detract from the lace. Oh well. Then I knit half a row of my Faroese shawl. I took probably thirty minutes trying to figure out where I left off. Even my row counter had gotten off since I last worked on this beast. I've had a busy weekend. There's lots I want to write about but not much time (going out knitting!). I got my good to be girl surprise package in the mail on Friday. It was so adorable. Amy really went all out creating these packages to thank the readers of her blog for her one year anniversary. She has much better photos of all the goodies. I finished the collar to Sam. I need to sew in the sleeves and the sleeve and side seams. Then I have to sew in a zipper. I haven't even found a zipper yet. Don't hold your breath. I knit with a few great new yarns at work. 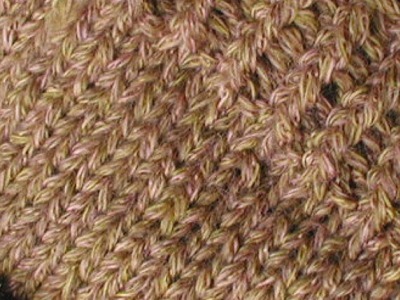 Teseo is a very soft, loosely spun wool/microfiber blend. It self-stripes in four monochromatic color shifts. I knit up a one skein broken rib keyhole scarf for a shop sample. It knits up very quickly and the colors are really great. 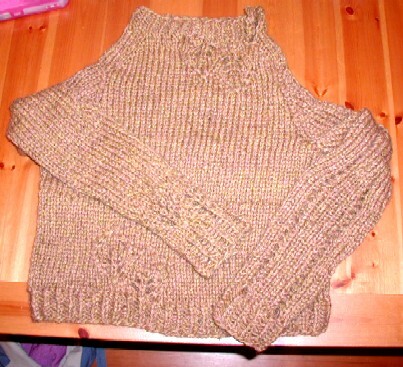 Today I started a Bouton d'Or baby sweater using a 100% machine-washable wool called Norma. It has great texture and is really fuzzy and soft. 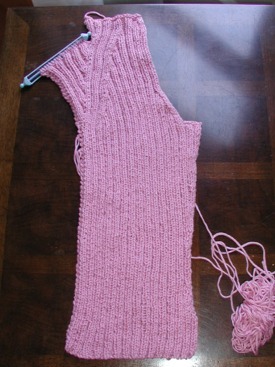 I'm making a simple cabled cardigan. Unfortunately it was so quiet at work today I knit the entire back and one-quarter of the right front. Speaking of work, the new website is up. It currently features a terrible photo of me pretending to learn how to knit from my wonderful co-worker Kristin. She's actually showing me how cool the Habu Textiles Shosenshi linen paper yarn is. And it is very cool. After making my Leaf Lace Pullover I am digging Teva Durham. But cruising around her site has left me a little stymied. She has many a poncho, wrap and capelet, which we all know I don't like. But this one just pushed me over the edge. I think the look on the model's face says it all. "I fought valiantly for France but was still burned at the stake." Thanks to ljc for alerting us to a soon to be must have item. I was this close to finishing the right front of Sam last night when I realized I had missed a decrease several rows down. I ripped it out. Hopefully I'll finish it today. Last night I went out to dinner with my best friend. We do this every month since we never get to see one another any more. She walked to my house because we were planning on having dinner at a really good Italian restaurant a few blocks from my house. It was a gorgeous evening, clear, warm, lovely. We got to the restaurant and found that they are closed on Tuesdays. We had a laugh and decided to try a new place a little over a mile away. We walked and talked. 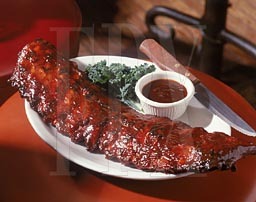 We got to restaurant #2 and were told in the snottiest way possible that there was a two and a half hour wait! We turned around and walked out. We chuckled again. We decided to head over to a Cuban restaurant on the ship canal. It was another half mile. When we got there we discovered that they had gone out of business. We tried to chuckle. There is a very good Mexican place further in the direction we were heading that we like so we headed over there--another .8 miles. From half a block away we could see swarms of people outside the restaurant. Not a good sign. We couldn't even get inside to see how long the wait would be. There were at least 30 people milling around waiting. Now we laughed, from fatigue and famine, at our ridiculous fortune. We decided to head up to the U District and get food wherever we could find it. We crossed the street and saw a family that we all used to go to preschool with. We stopped and chatted a bit. We told them our tale of woe. They offered us a ride and we gladly accepted. They dropped us off at my friend's house. We hopped in her car and headed straight to our favorite spot. We had to wait for a table there too but consoled ourselves with guacamole and plaintain chips at the bar. We felt a lot less guilty about our dinner after all that walking. Last night I got the courage to attempt over-dyeing my cat puke colored sweater. 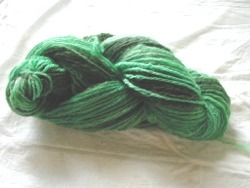 I got Jacquard acid dyes in Emerald and Jet Black and hoped to combine into a dark forest green. My sweater weighed 22 ounces so if I wanted to dye at 2% solution I needed to use .44 ounces of dye powder. Then I said screw it and just started pouring. I used about 3/4 of the .5 ounces of the green and just a sprinkle of the black. I was afraid of adding too much black and ending up with a gray sweater. 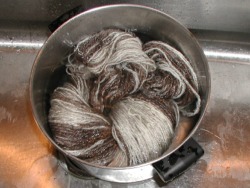 I also soaked a little handspun in case there was a lot of dye leftover. 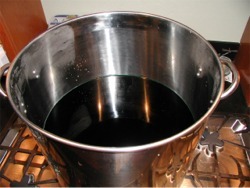 I got the vat of dye, water and vinegar up to 180°. I added the sweater and swirled it gently. 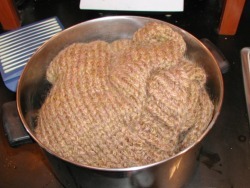 I didn't want to felt the sweater or damage it by stirring it too much in the pot. I let it sit for 30 minutes, keeping the pot at 180° and stirring occasionally. I pulled it out and burned my hands through my rubber gloves in the process. I hadn't thought this part out too well. 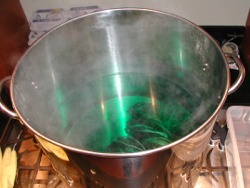 How do you get a steaming hot, soaking wet sweater out of an enormous pot without burning yourself, stretching out the sweater or dyeing your entire kitchen green? I tossed the handspun in to the leftover dye. See how light it is now? I spun the sweater dry in my washing machine. And when this morning it looked like this. As you can see it turned out very emerald green. It also did not dye evenly so there are splotches all over it. Still it's a lot better than when I started. And the line that ran across the torso is well camouflaged. I solved the Sam problem. I can't tell you why exactly this was so hard for me. When it comes to cooking there are two kinds of people, ones who must have a recipe and ones who never use a recipe. I am a great cook but I must have a recipe to work from. It's the same with knitting. You are either a slave to a pattern or you use it as a general guideline and do your own thing. I am a pattern slave. With Sam I was just not understanding a bit of the wording and I kept trying to make sense of the words. Finally, last night I grabbed a photo of Sam and blew it way up on the computer to look at the area I was knitting. I looked at my knitting. I looked at the photo. Then I got it. 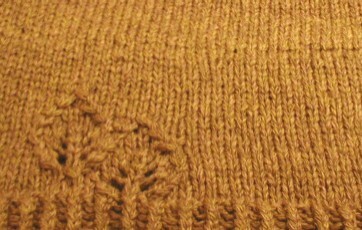 Then I was able to knit the rest of the front without looking at the pattern. In all I have knit and ripped this area at least four times. I even had to rip again last night because I misplaced a stitch as I neared the top. I will blame that on Carnivale. It's a bit mesmerizing. So here is the first completed front. And here's a close up of the troublesome area. Sam has finished her Martha in a lovely blue. Debbie Bliss is Killing Me! I finally got the courage to face Sam. She's been on time out for a long time. I got to the part where it all went to hell last time. And it went to hell again. Not quite as badly this time. I think I understand what she wants done here but I can't quite make it happen. 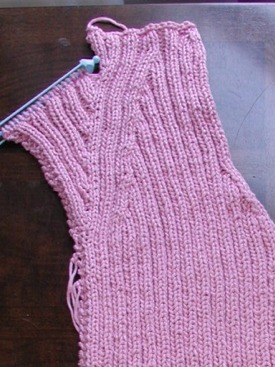 I think I will rip back again tonight and try to knit it and completely ignore the pattern. It's very frustrating and disappointing. 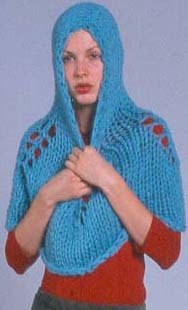 I searched for anyone else who might have had problems or even successfully knit one of these and I can't find one. It makes you wonder. I thought the guinea pig sweater was an isolated incident. Apparently I was wrong. Branching Out is blocking right now. Caryn got me. 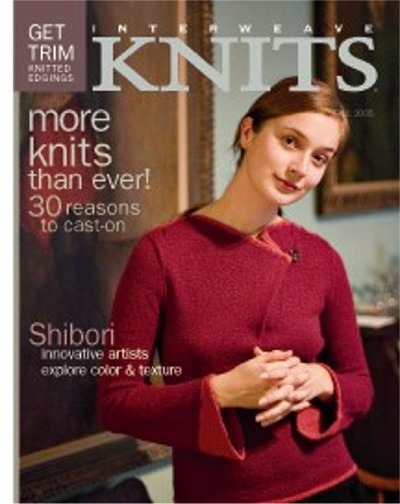 I was all set to post a picture and she said, "How 'bout the entire issue of Summer Knitters? Or at least that abomination on the cover! :)"
That was my plan. I had a little bit of guilt about running Maggie Jackson through the ringer twice in one month. But she's kind of asking for it, isn't she? So instead I'll offer you this, which I like to call, "Why is This Woman Smiling?" I know I throw around phrases like "looks like a yeti" quite a bit but really. 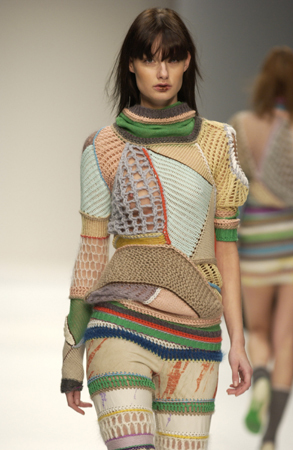 This sweater is just a mash-up of knitting sins in my book. 1) It adds at least 30 pounds to the person wearing it. 2) It features random tufts of furriness. 3) Popcorn seems to be erupting from the cuffs. 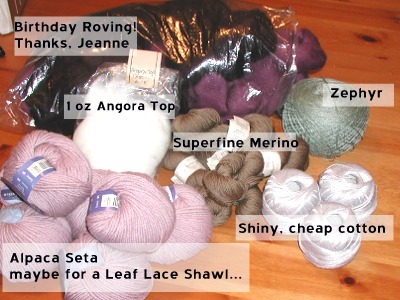 4) All the bother of knitting lace but no pay off. Can you see the lace pattern? It just looks holey to me. 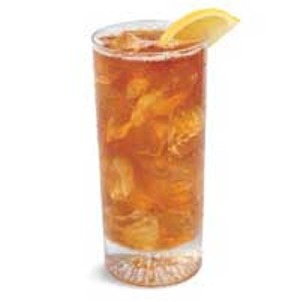 5) It looks like a yeti's armpit. 6) Oh, I can't go on...just looking at the photo this long is hurting my eyes. I just cast off the last stitch a moment ago. Tomorrow weaving in and blocking. 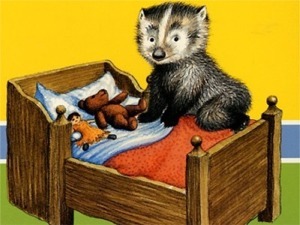 Now bed. Branching Out is just flying off my needles. I started it on April 30th while waiting to be picked up for the Portland trip. I worked on it here and there. 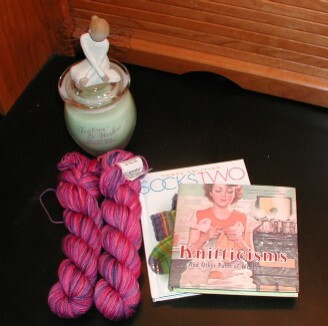 I finally finished the first skein on Sunday. 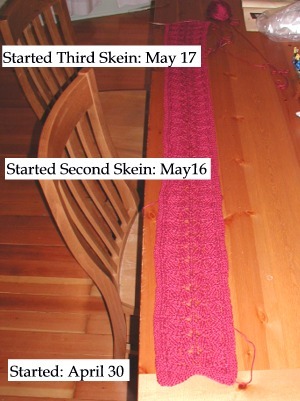 I knit the entire second skein on Monday. And today, I made it about halfway through the last skein. 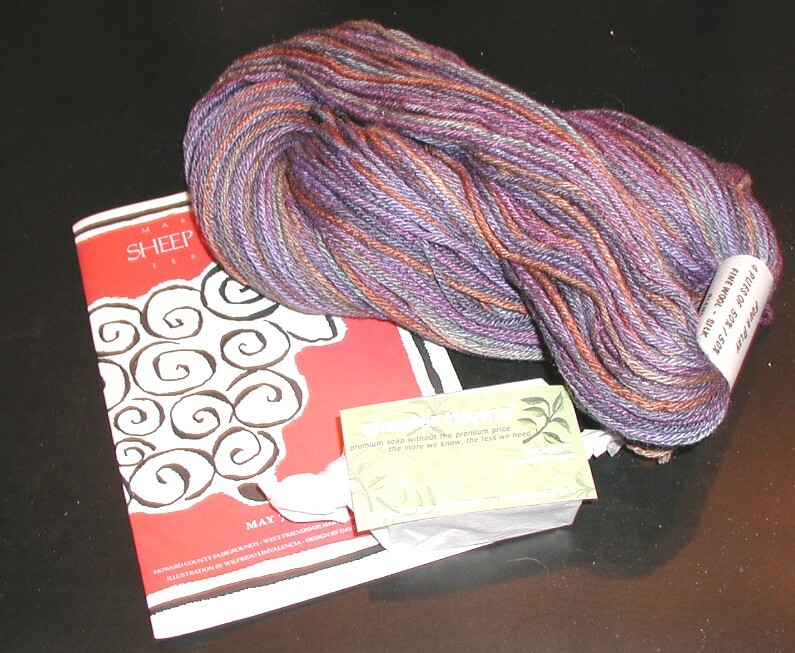 The Noro Lily is so soft and great to work with. It doesn't split at all. It glides over the needles. Behold the progress. 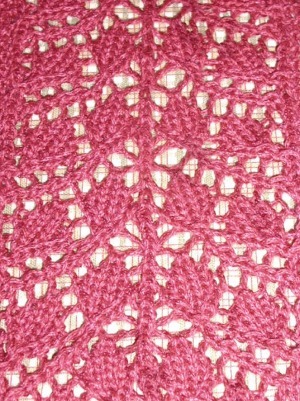 I fiddled a bit with the grafting on the Leaf Lace Pullover. I tried to loosen it up all around and gave it a bit of steam. In some areas it is beginning to look reasonable but there is still a strong line. I was so glad I finally captured the leaf lace in a photo. And the putrid color of the yarn. I can't wait to overdye this. I am such a lucky girl. I won a blog contest over at The Scottish Lamb and look what I got. 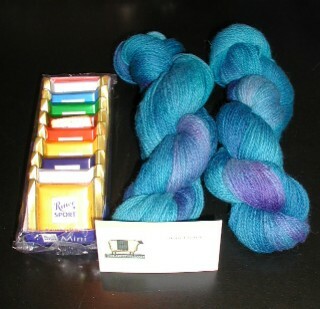 Beautiful yarn and little Ritter Sport bars from Germany (Back off, Mariko. They're mine.). I love that she has her own blog business cards. I just finished making and decorating 42 cupcakes to bring to my son's school today. Yikes. The bolero is done. It just needs it's ends woven in and to be blocked until it begs for mercy. Sam is working on a sleeve. She's already finished her back and both fronts. 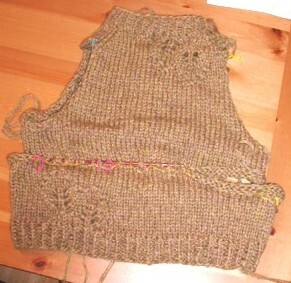 Stinkerbell reports a back, part of two sleeves and part of a front done but no photos. Kristy had a small needle problem but is off to a nice start. Holly has a back and a front. Tacha has completed her back. Melanie is on the back of her Martha, knit without eyelets or beads. I didn't find any Butterfly news. Is anyone making any progress? My oldest son had his 7th birthday party today. I had to clean all morning. Then we had 8 boys aged 5-8 running wild for two hours. I was pooped. Wes had a film event to go to so I invited friends over to knit with me. Molly and Marti joined me while I finished seaming up the Leaf Lace Pullover and weaving in the ends. The kitchenering of the upper and lower body looks pretty crappy. There's a definite line running across the sweater. I'm not sure I see why the pattern was written to graft a bound off edge to live stitches instead of just grafting live to live stitches. I left those ends. I may pull it out and try it over. It may still look crappy. Of course that would also give me a chance to make the body slightly longer. I still need to find a huge button for it and need to decide what color to dye it. I finished the edging on the body of the bolero yesterday. 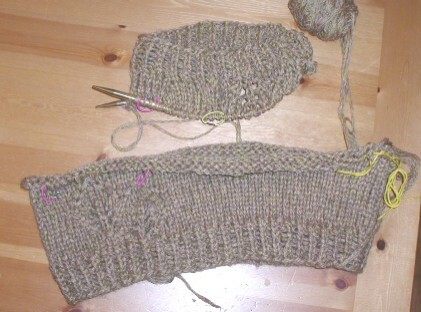 I just need to knit the sleeves down a bit and do the ribbing. 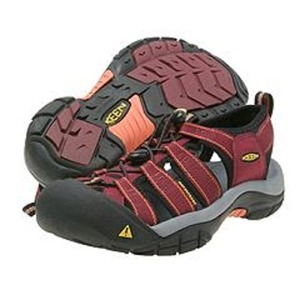 It has a double eyelet ribbing which echoes the double eyelet increase nicely. It is in desperate need of blocking. Look what I got in the mail! It's like all the highlights of MDSW in a little bundle. It just goes to show. Whining pays off. Thanks Rock Chick. You made my day. Knitwear designer, Clare Tough, had a small mention in the latest Vogue Knitting. After perusing her collection I think I've found my favorite. 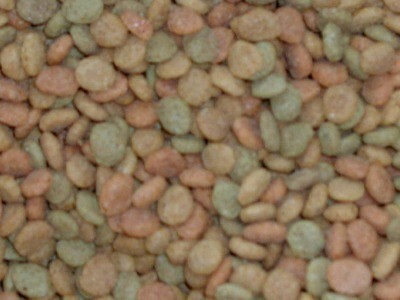 I will not be showing you any photos of cat yak but here is the cat food. See the similarity to the sweater? The sweater continues to grow at an alarming rate. I've finished the top and bottom of the body and started a sleeve last night. Please ignore the giant red metal needle jammed through the sweater. I was trying to keep the two sections from rolling away from one another while I took the photo. Mary commented, "since when is a beautiful shade of heather grey a "horrifying puke-like" color??" Well, the photo from yesterday was taken at night in my dark house. 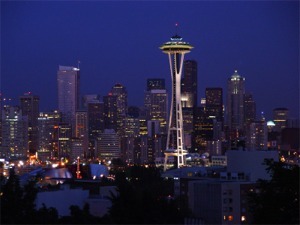 Here's a picture taken in what little daylight we have in Seattle this morning. It is the exact color of my cat's yak. Ick. And Wanda asked what pattern I'm using for the bolero. I'm making it up, using Barbara Walker's Knitting from the Top as a rough guide. 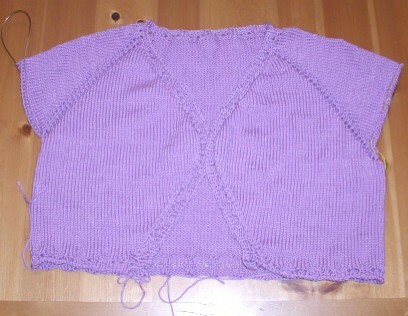 The bottom body section of the pullover is done. It is on waste yarn while I work down from the neck. Why am I going so slow on this bolero? It's so easy to knit. I just need to put the sleeve stitches on waste yarn and try it on to see how much farther I need to go. I am actually making progress on the Faroese shawl. See? This is 8 or 9 rows done so far. Julia suggested that those of us not going to MDSW share a slice of everyday life. It's 9:30 am. I am half-asleep sitting on the toilet. My six year old son bursts in and says, "Mom, here are the Mother's Day cards I made for you at school!" Yes, happy Mother's Day indeed. I started a new project yesterday on a whim. Normally I don't like really bulky knits since they make me look, well, bulky. 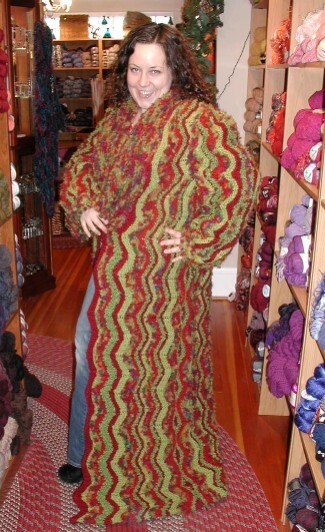 But I was intrigued by Teva Durham's Leaf Lace Pullover. It's construction is really unusual and I can't say no to leaves in lace. I had briefly and half-heartedly looked for yarn for this project on the many, many shopping excursions I've been on lately but I couldn't bring myself to plunk down $70-100 for a sweater I might hate and never wear. 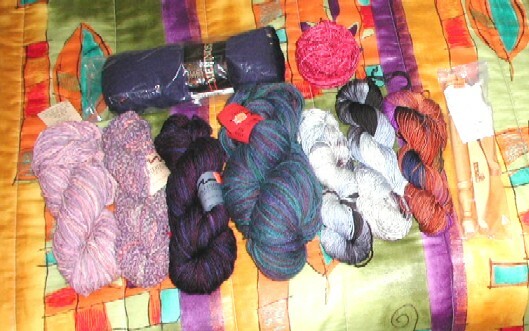 Then I remembered a big bag of chunky wool I got in the January swap. It's Swa Laine 100% wool with an interesting cable construction in a horrifyingly puke-like color. Held doubled and knit on 15s I got gauge with it. 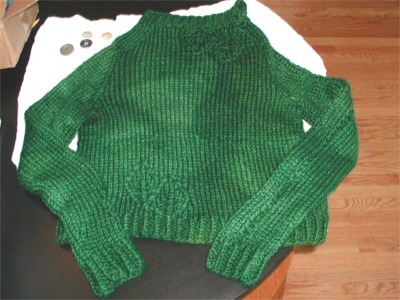 I plan on knitting the sweater and over-dyeing the whole thing when I'm done. I've already finished the lower body and have started on the upper body. Photos tomorrow. Hmmm...apparently I thought yesterday was Thursday. I think that gives you an idea what my week's been like. I'm going back to camp! And best of all many of the wonderful women I met last year will be returning. I'll be at Camp 2. If anyone in blogland is coming, I'd love to hear from you. 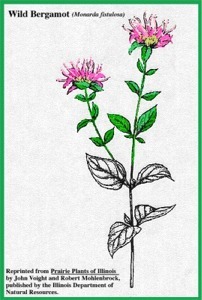 I've made good progress on several projects. 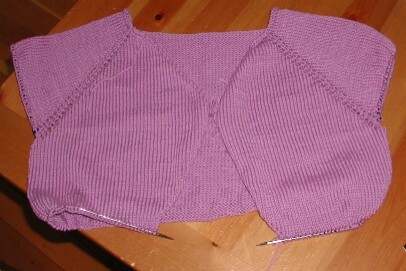 The top-down bolero is growing and looks like an actual garment now. I have just a bit longer to go then I'll add an eyelet ribbing to the bottom, knit the sleeves (short) and add the ribbing around the front bands and neck. 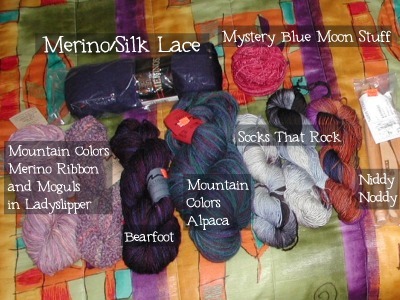 I started Branching Out on Friday in some Noro Lily that's been in my stash for over a year. It's lace and a stash buster. Woohoo. 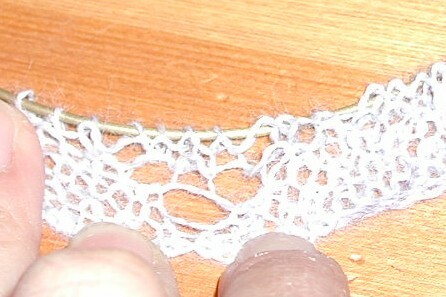 It's a very easy lace project made even easier by the silky yarn that never splits or snags. I'm also on row 8 of the Faroese Shawl. I can't take my eyes of this one for a second or it all goes to hell. I actually dropped a few stitches and just half-assedly grabbed some back up. The yarn overs looks very odd now. Oh well. I guess it'll just be odd. Secret Pal 4 is over. Tam at Knit One, Purl Forever was my pal. She sent me so many wonderful gifts. I feel very spoiled. Thank you, Tam. I was given the task of being Rock Chick's Secret Pal. When I read the email I immediately thought, "I am screwed." Why couldn't I get a secret pal who is dull with low standards? I had so many ideas. Wes and I were going to take the yarn I was sending to her around the city and photograph it in Pearl Jam significant locations. But the baby sitter cancelled on us. Seriously, how lame is that? Then there was the stitch marker making debacle. I tried to make those skrinky dink stitch markers using some of RC's inspirational photos. Total flop. They all came out too big and curled up and burnt and awful. Secret Pal was a lot of fun though. I'm seriously considering Secret Pal 5. While shopping at Farmhouse Knit Shop in Beaverton I spent a few minutes flipping through some of Maggie Jackson's books. 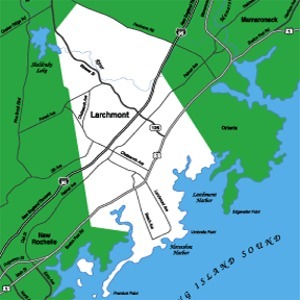 How do you say "What the hell is this" in Gaelic? I was having a hard time choosing between this one and this one. Wes preferred this one because it has a "Road Warrior/Sheena of the Jungle thing going on." Since it's his birthday today I have to defer to his opinion. I have so much to say about our trip to Portland. I'll start with some photos and fill you in on the detail later! 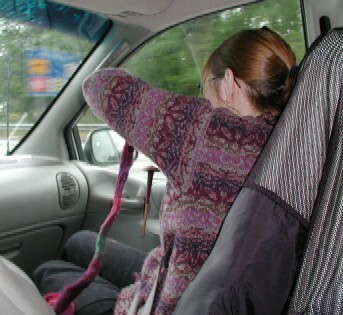 Marti was about 10 minutes outside of Seattle when she whipped out her drop spindle for some car spinning. 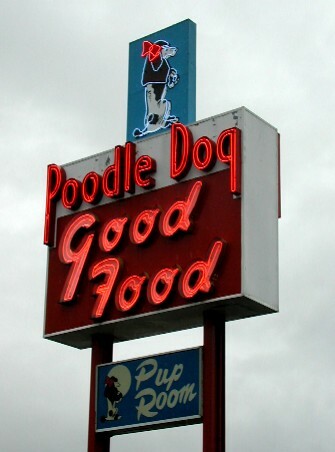 Our kitchiest rest stop, The Poodle Dog in Fife. Jill models the Portland edition of What the Hell is This? Work it! 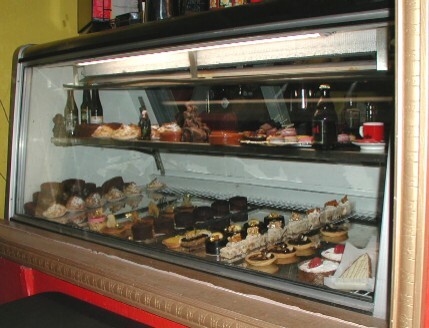 A trip to Pix Patisserie, recommended by Mariko. And here's what I came home with. More later. I'm off to Purlygirls. I was shocked to hear that my secret pal was going to be sending me even more stuff. What did I do to deserve so made goodies? Koigu! I may faint. Thanks so much, Pal. I'm all wiped out from my trip to Portland. I have pictures and lots to tell but it will have to wait until tomorrow. Good night.